The spirituality of stewardship and the practices that give witness to its truths are changing the heart and face of the Church in the Philippines, which identifies as a Church of the Poor, and beyond. What are the truths driving this conversion? Christian stewardship is about our identity in Jesus Christ. It’s about our trust in God’s promises. It’s about our gratitude for all God has given. It’s about responding to our God in love. If you are unsure, ask the more than 200 delegates to the first ICSC-SPI Asian Pacific Stewardship Conference. In a written resolution following the conference, they determined that Christian stewardship is key to the renewal of persons, communities, churches and the natural world. 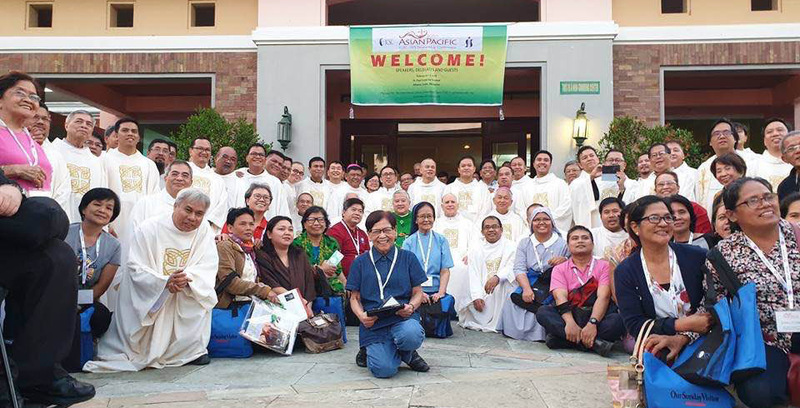 The conference, sponsored by the International Catholic Stewardship Council and its Asian partner, Socio-Pastoral Institute, was held February 4 to 7, 2019 at the St. Paul Center for Renewal in Alfonso, Cavite, Philippines. Attendees included 68 priests and 12 bishops from 27 dioceses. Major funding and coordination of the conference came about through the efforts of Mila Glodava, director of stewardship and administration at St. Vincent De Paul Parish in Denver, Colorado, Jose Clemente of SPI and Michael Murphy of ICSC. There is no doubt that the Holy Spirit is moving in the stewardship efforts of the Church of the Philippines. The solemn declaration from the first Asian Pacific Conference is urgent: Let us build a Catholic Church that is imbued with the spirituality of stewardship. Let us build a Church that makes disciples who dare to go to the margins of society to proclaim the Good News. Let us build a Church that lifts the poor from poverty and is marked by preferential love for the least and lost. Let us participate in breaking in of the Lord’s Kingdom by sharing our blessings with one another, one gift at a time! In this beautiful declaration, and the stewardship practices that it embodies, we are reminded of the first disciples and the early Church. We remember the practices that brought the Christian Church to over two billion members today and it gives us hope. We thank the Church of the Philippines for their courage in saying “yes” and their willingness to do the hard work of making disciples who respond with the heart of Christian stewards. They are a model for us all.